Redeveloped website for Go-Kan-Ryu karate club operating across four countries. GKR Karate operates across four countries: Australia, New Zealand, the UK and the USA. As such, the website was required to service their consumers in all of these locations. 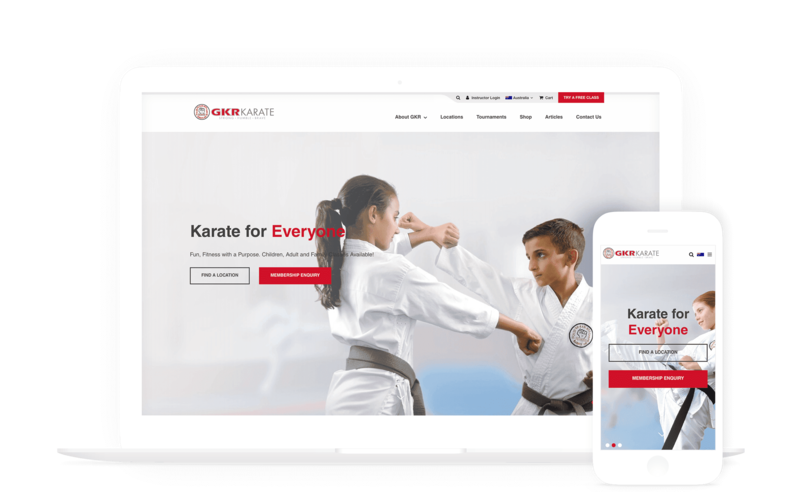 As the website is often an initial point of contact for consumers, GKR Karate wanted it to better reflect the quality of the organisation and improve the first impression given online. Primary outcomes sought included increased lead generation and immediate online conversion. Another important consideration was the ease of use of the website for members of staff, leading to increased engagement of current staff and students. 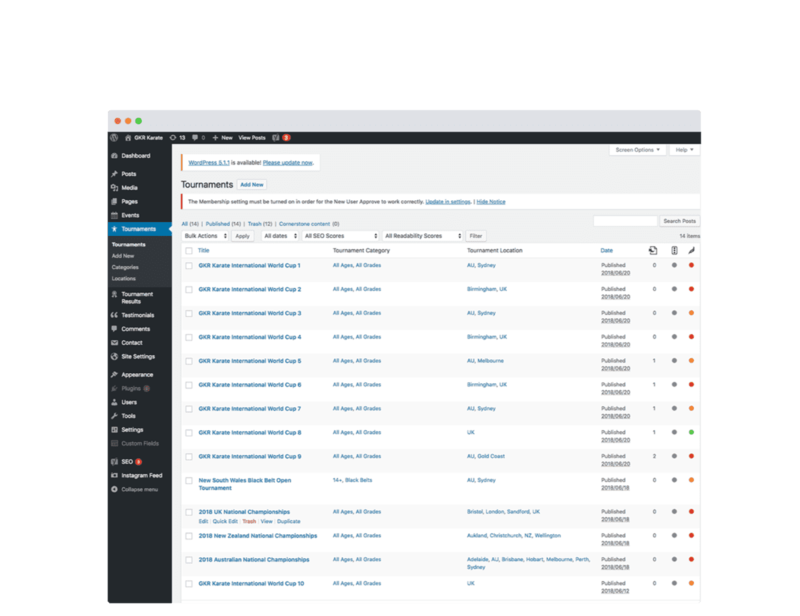 The GKR Karate website was built with our own custom WordPress Hardening Framework Consul™, specifically designed for business enterprise deployments. 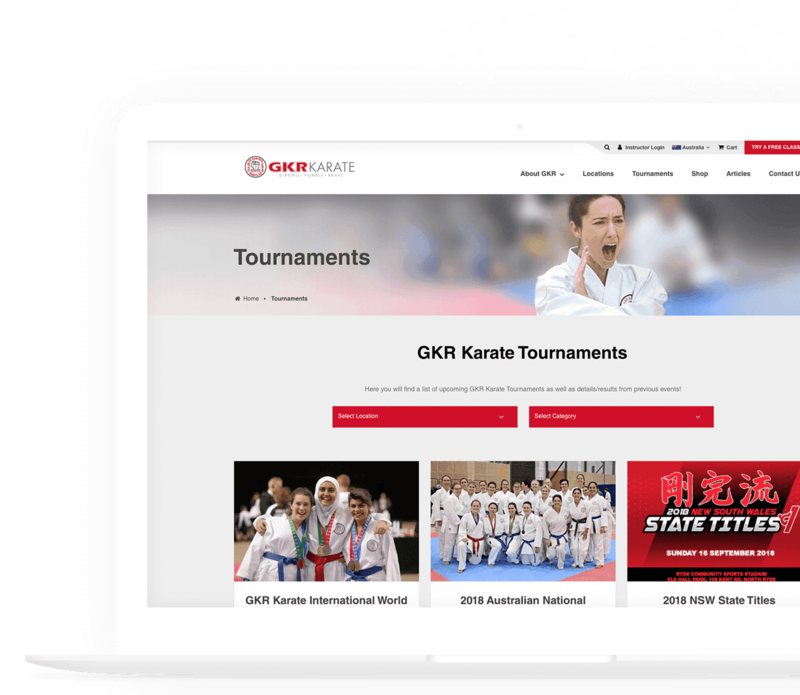 The platform utilises WordPress, providing GKR Karate with all the benefits of its acclaimed user centric features such as its ease-of-use content management including simple and flexible editing and web design customisation. In addition to these features, Consul™ provides a new robust system architecture to WordPress that can be customised and scaled to deliver functionality, style and enhanced user experience for advanced business application purposes. As GKR Karate spans four countries, certain content such as tournaments and staff pages are region specific. Our solution to this was to provide geolocation specific personalisation functionality. Now, users of the website are presented with information relevant to the area in which they live. GKR Karate have the ability to assign content to a region through a user friendly Content Management System (CMS). This allows them to update the site universally (displaying content to all four regions) as well as uploading country-specific content. GKR Karate recognised that parents liked seeing competition results and photos of their children competing in tournaments on the website. While guidelines were previously in place to facilitate regional managers to take photos and upload results of competitions, a difficult to navigate website backend hindered this. The lack of photographs and readily available competition results led to complaints from parents. Our newly implemented, user friendly CMS, Consul™ makes it easier for regional managers to source and upload this information quickly. As parents were frequently seen taking photos on their own devices at tournaments, we also incorporated an automated feature that can source and gather these photos from social media using tournament specific hashtags. These photos are then displayed on the website, satisfying consumers and reducing pressure on regional managers. 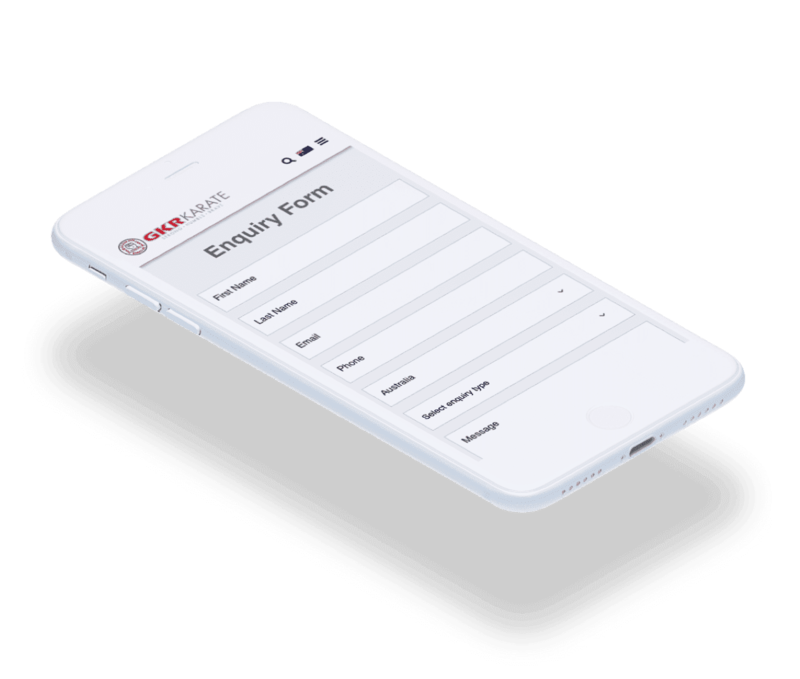 The average customer of GKR Karate does a limited number of classes before trailing off, making the pursuit of lead generation crucially important in the website redevelopment. Considered, strategic calls to action were implemented throughout the website to encourage conversions. These relevant calls to action present information in a familiar web design layout and encourage the user to complete desired enquiry forms. 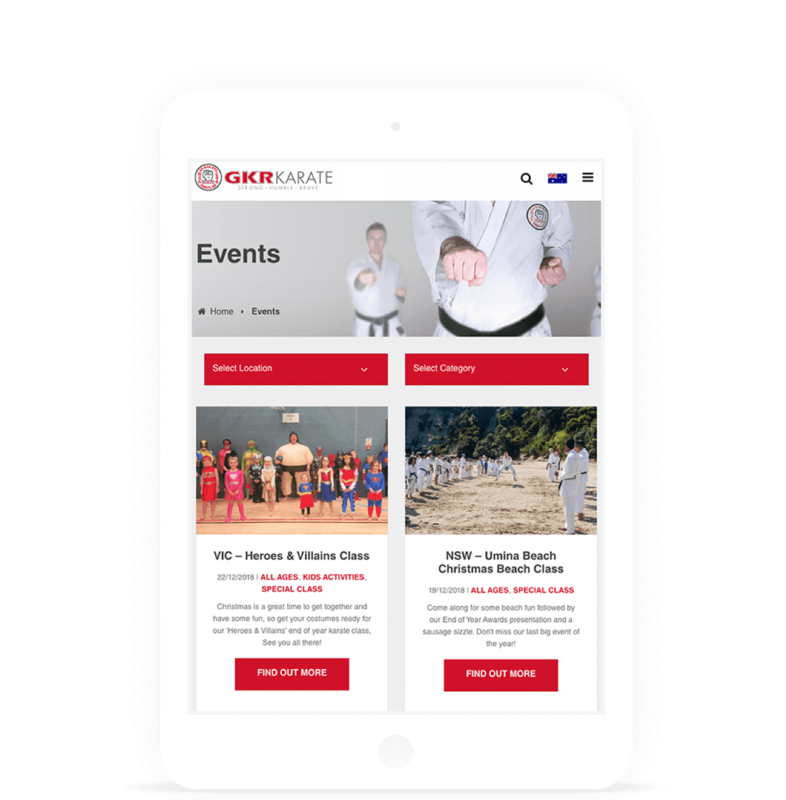 Prior to working with The Digital Embassy, GKR Karate had ‘Location’ and ‘Shop’ sections of their website developed by a third party. The look and feel of the previously created sections were inconsistent with our newly commissioned web design and posed a technical challenge to integrate. They were incorporated through the utilisation of subdomains with goal of developing them within the new CMS framework at a later stage. GKR Karate had many types of content they required to appear on the new website. We established a clear navigation path through this content by analysing the needs of the consumer and the desired outcomes of GKR Karate. With user journeys outlined, we created a clearly laid out menu bar and information hierarchy to be of use to all GKR Karate users. Since launch, GKR has seen a roughly 50% increase in leads compared to the same time last year. They attribute the majority of this increase directly to their new website. The newly developed mobile responsive website provides GKR staff with an easier system to navigate and upload information, contributing to what the management team considers to be an all-time high level of morale amongst the management and instructor base. The website also provides students with easier access to tournament information, and potential consumers with location specific content and calls to action promoting conversions.